LANSING – In the months before Michael Martin died, he rarely went to school unless his mother was home to make sure he got there. Most weekday mornings, Joanna Wohlfert reports to her job in Ionia by 6 a.m. She and Michael’s stepfather, Joe Wohlfert, routinely left the house before Martin, 13, needed to get on a bus to Everett High School, where he was in eighth grade. Until last fall, Michael could be counted on to get to the bus stop near his Lansing home every day, his mother said. Michael had been a good student who loved school and didn't skip class. The bullying, Wohlfert said, began in the fall on the bus and at school. In December, Michael stopped attending classes unless she was at home to make sure he went, Wohlfert said. On Jan. 25, Michael died at Sparrow Hospital, two days after attempting suicide in his home. Wohlfert said she repeatedly asked for help from the Lansing School District and Dean Transportation, a private company that operates bus services for the district. The district and Dean Transportation staff failed Michael, Wohlfert said, and the inaction of school staff contributed to his death. Lansing School District spokesman Bob Kolt said Friday that school staff responded appropriately to Wohlfert’s reports of bullying. He said he would not comment further because the district is investigating Michael’s death. Lansing police said Monday they are investigating bullying related to Michael's death. Michael walked into Everett, head down and shoulders slumped, with a hood covering his face one day in early January. That's the image Wohlfert says she hasn't been able to stop thinking about since his suicide. She had just dropped him off in front of the school that day. Michael looked defeated as he got out of her car that day, Wohlfert said. A sadness hung over him. Wohlfert said that's what she told Assistant Principal Priscilla Ellis later that day when they spoke in person for the first time about Michael’s chronic absences and struggles with bullying. After dropping Michael off at school that day, she walked in the school office and asked to see Ellis. Ellis is assistant principal at what is officially called Everett New Tech High School, a magnet program within Everett High School that uses technology to facilitate project-based learning for students. Wohlfert was reaching out to school staff as early as November to ask for help with Michael's declining grades and absences, emails she provided the State Journal show. The district’s policies require that excessive absences, even when verified by a parent or guardian, “will be investigated by school district personnel," according to the district’s student handbook. Wohlfert said Michael’s absences were not. The only notification she received from the school district were automated phone calls in the evening outlining class periods he’d missed that day. While she said Michael never described to his mother the verbal insults hurled his way, his friends have since told her he was teased about his weight, his glasses and his braces. And, they told her, he was assaulted when he was slammed against a wall in the school’s lunchroom this school year. Attendance records Wohlfert obtained from Everett High School show Michael's absences date back to September. He missed 33 days this school year, more than six weeks of classes. "...I have found him home, at least one day a week," Wohlfert wrote in a Nov. 30 email to Ellis. "I do not want him to get into this sort of pattern and want to put a halt to it now, so any help I can get for him would be appreciated." Ellis never responded to that email, Wohlfert said. She had reached out “numerous times,” Wohlfert wrote, and she did not know what else to do. “I AM ASKING FOR ANY HELP I CAN GET,” she wrote, in all capital letters. In an email reply to Wohlfert, West wrote she had spoken with Michael “just before break,” after a teacher sent him to her office. “Despite my efforts to talk with him, offer him support, etc., he absolutely refused to speak with me or even acknowledge I was speaking to him,” West wrote. Wohlfert also reached out more than once to Assistant Principal Ellis. In another reply to an email Jan. 8, Ellis wrote to Wohlfert about speaking with Michael about the bullying on the bus. He could not give her any names, Ellis wrote. “I have asked him to stop by the office at the end of the day so that I could go out to his bus to try and figure out who the student(s) may be but that has not happened yet,” she wrote. Ellis asked Wohlfert in the email which bus Michael rode. Wohlfert said she believes Michael would have been too worried about possible retaliation to agree to accompany Ellis to the bus. It’s unclear whether West or Ellis followed up with Michael again before his death Jan. 25. West cited confidentiality concerns and declined to talk about Michael when contacted by the State Journal. Ellis didn’t return a message left by the State Journal. School district policies found on its website outline that investigations into reported bullying "must be completed as promptly as the circumstances permit and should, if possible, be completed within three (3) school days after a report or complaint is made." The Lansing School District declined to answer questions about staff interaction with Michael and Wohlfert. A statement the district issued Monday afternoon, in part, reads, "The Lansing School District is engaged in a comprehensive and on-going investigation and is working closely with the Lansing Police Department. It is the policy and practice of the district to not comment or share any details pertaining to the investigation while it is on-going." Lansing police have "an open, on-going bullying investigation with regard to the Michael Martin suicide," LPD Public Information Director Robert Merritt said in a statement. "We are working with the Lansing School District and we encourage anyone with information on this case to come forward by calling Police 483-4600," Merritt wrote. School officials never recommended Michael see a doctor, Wohlfert said, but in early January she took him to see one. He was prescribed medication for depression the same day he attempted suicide, Jan. 23. In early January, Wohlfert said, she left three messages with Dean Transportation trying to speak with Michael’s bus driver or a supervisor about the bullying he was struggling with on the bus. Wohlfert said no one from the company returned her calls. Company officials will not answer questions about how staff responded to Wohlfert's messages or whether Lansing school officials reached out to the company regarding bullying on the bus, Josh Hovey, a company spokesperson, said in an email. In a statement the company said it "is committed to assisting the Lansing School District and Michael’s family in investigating any circumstances relating to any and all claims of student bullying in school or on the school bus." Dean Transportation "trains drivers on student behavior," said the statement. It’s unclear if Ellis or other school staff ever reached out to Dean Transportation before Michael's death. District policy places "general supervision of the organization and operation of the school transportation system shall be the responsibility of the Superintendent," according to the district's website. According to Lansing School District's website, Dean's buses are equipped with a two-camera video recording system, "for the purpose of improving student safety. This will allow school district and transportation staff to review alleged disciplinary incidents and/or vandalism which might occur on a bus." In an email to the State Journal, Hovey said Dean Transportation staff "are using all available technology to complete their investigation which is still ongoing." He declined to say whether that would include a review of camera footage from the buses on Michael's route. Dean Transportation employees take part in a "Student Health Care Management" program through Lansing Community College, according to the company’s website. Through that program the company is "...able to provide education on the most common medical and behavioral concerns that face today’s youth. How these concerns affect our drivers and attendants, and what the appropriate response is when dealing with a potential incident during a run, is the main focus of our educational training." In Ingham and Eaton counties, 16 people ages 25 or younger died by suicide in 2017, according to local coroner reports. That’s more than double the number of people in the same age group who died by suicide five years ago in the two counties. Suicide rates among youth are on the rise nationally, according to Clark Flatt, a national advocate for suicide prevention. Flatt is also the founder of The Jason Foundation, an organization that provides more than 200,000 teacher training sessions on suicide prevention each year around the country. Lansing schools has "state and board approved anti-bullying policies, and resources in place to support our ongoing efforts to prohibit bullying in any of the District’s programs, services and activities and provide a safe and nurturing educational environment for all of its students," according to the school district's statement. Lansing School District's Board of Education passed a policy calling for "professional development training in the risk factors, warning signs for suicide and depression and about the protective factors that help prevent suicide..." according to information on its website. It's not clear whether the district implemented that training or how often it is conducted. The Jason Foundation offers training at no cost to school districts in 20 states where "The Jason Flatt Act" has been adopted, Flatt said. Michigan law encourages teacher training in suicide prevention but doesn't mandate it, and many districts don’t provide it as a result. State Sen. Curtis Hertel, D-Meridian Township, aims to change that. After 13-year-old Evan Thompson, a Haslett Middle School student, died by suicide in October of 2016, Hertel introduced Senate Bill 0464. The proposed legislation would have mandated teacher training. It had bipartisan support but died in committee at the end of last year. Hertel said he's already begun efforts to reintroduce it. "Hopefully we can get this done," Hertel said. "We have an epidemic of suicide not just in Michigan, but across this country. Michigan has to follow what many other states have done, which is to invest in help and training to help stem this crisis." Ellis, New Tech High School's assistant principal, came to the hospital the night Michael was admitted, Wohlfert said, but Michael's family asked her to leave. “I felt like, ‘Why be there now? Why show your concern now? Why show that you care now?’" Wohlfert said. "I’ve been reaching out and reaching out and reaching out. He was just not important to her. I just felt like it’s too late." Hundreds of Everett students released yellow and blue balloons near the school's track Monday in honor of Michael. Wohlfert attended. She clung to her son and Michael's brother Dimitri Brown during the release, and was presented with blue roses by students. Michael's step-father Joe Wohlfert said the school district needs to evaluate how Michael fell through the cracks. 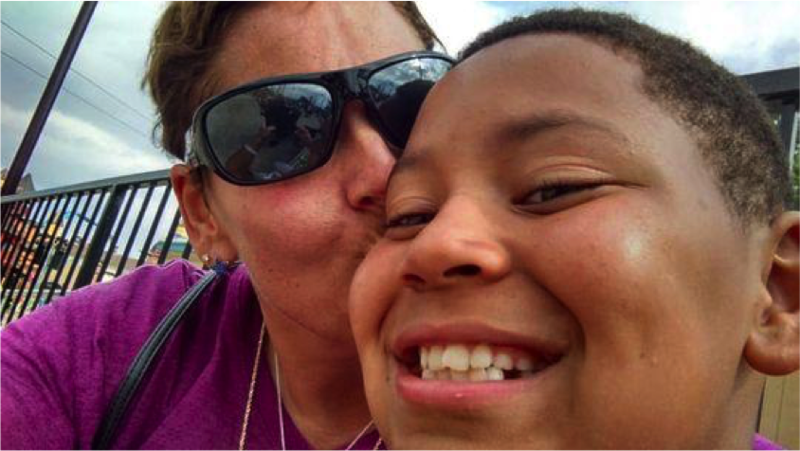 “His life meant just as much as any of the other kids that are there,” Joanna Wohlfert said. People seeking help for themselves or others can call the National Suicide Prevention Lifeline at 1-800-273-8255. Among the warning signs of suicide are: talking about suicide, expressions of hopelessness, personality changes, depression or giving away possessions.Learn more about the resource at www.suicidepreventionlifeline.org. People seeking help for themselves or others can find a list of crisis hotlines in Michigan at http://www.suicide.org/hotlines/michigan-suicide-hotlines.html. In the Lansing area, those hotlines include The Listening Ear at 337-1717 and Gateway Community Services Statewide Crisis Line at 351-4000. For more information about suicide resources visit http://www.sprc.org/states/michigan.